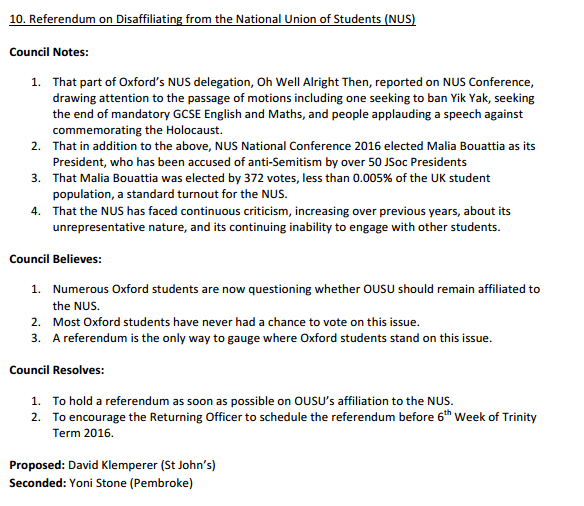 In a real car-crash of a motion to OUSU Council, David Klemperer, one of Oxford’s NUS delegates and a member of the ‘Oh Well, Alright Then’ slate, has proposed that OUSU hold a referendum in 5th week of this term on its affiliation to the NUS. I don’t want to get into the severe logistical difficulties facing this suggestion – I’m sure any representative from OUSU would be more able to enumerate problems such as giving time for students to campaign and generating enough interest that turnout at least reaches the paltry levels seen in the last NUS referendum. That said, there are more than a few other problems with Klemperer’s proposal. In the motion, Klemperer bizarrely refers to the NUS “seeking to ban Yik Yak”. He is describing – in admittedly strange terms – a resolution to speak to various social media sites to examine the possibility of reducing levels of hate speech from anonymous accounts during election periods. Since such abuse can in some cases amount to criminal behaviour, it is hard to understand the rationale behind criticizing the motion. It is even harder to see how Klemperer can have so vastly misinterpreted its intent. Such bias and lack of attention to detail is – unfortunately – typical of this motion. The section in which this reference is found lists a few, apparently unconnected events from this year’s NUS conference. No explanation is given for the list, but it must be assumed that Klemperer believes them to be obvious reasons that Oxford should hold a referendum on NUS affiliation. Next on the list is a motion against English and Maths being compulsory at GCSE. The purpose of this is to help students at colleges forced repeatedly to retake English and Maths, despite the irrelevance of these subjects to their life goals. Some might take issue with this on paternalistic grounds, but it is surely not uncontroversially a reason for us to abandon the entire institution of the NUS. Another complaint regards the NUS’ democratic structure. Klemperer, an advocate of the ‘One Member, One Vote’ (OMOV) system, takes issue with the fact that the new president, Malia Bouattia, was elected by less than 0.005 per cent of the UK student population. This, of course, is simply how the NUS works. If Klemperer were advocating for Oxford to pursue aggressively OMOV, perhaps this would be a legitimate point to make, but it is hard to see its relevance to the question of disaffiliation (would it be hitting below the belt to point out that Klemperer wasn’t particularly pleased with the results of OMOV in the Labour leadership election over the summer?). I think the electoral system of the UK government is hopelessly flawed and in need of some kind of proportional representation, but I don’t think Oxfordshire should become an independent state because of it. Our national anthem would have to be Shakira, but a terrible a capella version. It may seem strange, but this argument speaks to Klemperer’s true reasons for proposing this motion. He doesn’t agree with NUS policy. He finds that his views are shared by a minority of students in the country. This is an uncomfortable position for anyone to be in, and he has my sympathy. But this disingenuous, ill-considered, self-serving piece of political pageantry is no kind of solution. Underlying all of this is the election of Malia Bouattia as NUS president, and it is odd that Klemperer only briefly mentions the accusations of anti-Semitism that have been levelled at her, since it seems obvious that this was his primary motivating factor. Bouattia, it is clear, has questions to answer regarding her free usage of vague and euphemistic phrases like “Zionist-led media”, but to her credit she has sought dialogue with concerned students. The Union of Jewish Students has also struck a conciliatory tone. Meanwhile, Klemperer et al. want to stick their fingers in their ears and their heads in the sand. The idea that the proper response to a democratic decision with which one disagrees – whether it be concerning Yik Yak, the curriculum, or the election of a president – is to disaffiliate from the institution that made that decision is, it seems to me, fundamentally misguided. To paraphrase a slogan of the obnoxiously named ‘Oh Well, Alright Then’, democracy is not about getting everything you want, all of the time. Whether you are in favour of holding a referendum or not, you should not have to accept a motion like this in your student union. Anyone who does want a referendum should demand a motion that has a better relationship with the truth, as this would surely get any campaign to leave off to a far less acrimonious start. A response to Luke Barratt’s piece from David Klemperer can be found here: ‘In defence of my NUS referendum motion: a response to Luke Barratt’. What a badly written article. If you’re going to disagree with Klemperer, at least attempt to tackle his arguments head-on. You can’t just dismiss his argument with constructions you learnt in your English Language GCSE persuasive writing coursework. Please, Cherwell — if you’re going to try and add to the NUS debate through publishing different views, make sure they have some level of critical engagement. what do you think about holding a referendum (i.e. the substance of the motion) Mr Barratt? Would it be a low blow to use these words to describe this article? It may seem strange, but this argument speaks to Barratt’s true reasons for opposing this motion. He doesn’t agree with holding a referendum. He finds that his views are shared by a minority of students in the country. This is an uncomfortable position for anyone to be in, and he has my sympathy. But this disingenuous, ill-considered, self-serving piece of political pageantry is no kind of solution. Luke, don’t you have some finals to be failing?